Jacob Sztokman is a 47-year old hi-tech sales and marketing professional turned social entrepreneur. On a visit to Mumbai in 2011 while working in International Marketing, he toured the city’s slums and was deeply moved to work on the issues of poverty and illiteracy among the children of India. He later met with grassroots Indian NGOs who not only provided research, experience and expertise, but also inspired him to take action. Together they developed a model for combining long-term and short-term solutions by bringing international volunteers to work on food distribution and literacy. The Gabriel Project Mumbai is developed in close conjunction with grass roots Indian NGOs and the JDC and opened its activities in June 2012 to correspond with the beginning of the Indian school year. 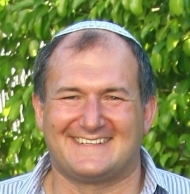 Jacob was born in Melbourne, Australia, and immigrated to Israel in 1993. Jacob’s professional life has been in the world of Sales and Marketing, and has worked for companies including SafeNet, IDT, and DSS (Driver Safety Systems). In 1998, after several years volunteering with food distribution to impoverished families in Jerusalem, he helped establish Shachen Tov, a volunteer organization that has since grown to provide food and empowering to over 1000 families in over 15 cities around Israel. Jacob brings to The Gabriel Project a unique combination of management experience and deep commitment to social justice. Jacob is also completing a Masters degree in Community Development at Hebrew University, Jerusalem. He is driven by the fundamental belief that as a Jew he must take responsibility to help alleviate human suffering around the world. Find out more about Gabriel Project Mumbai! Read more about GPM on their Blog!